Plans for the evolution of Pleasant Street and realignment of Alt Avenue in downtown Sandy are somewhat in flux in the wake of the June 12 City Council workshop at City Hall. 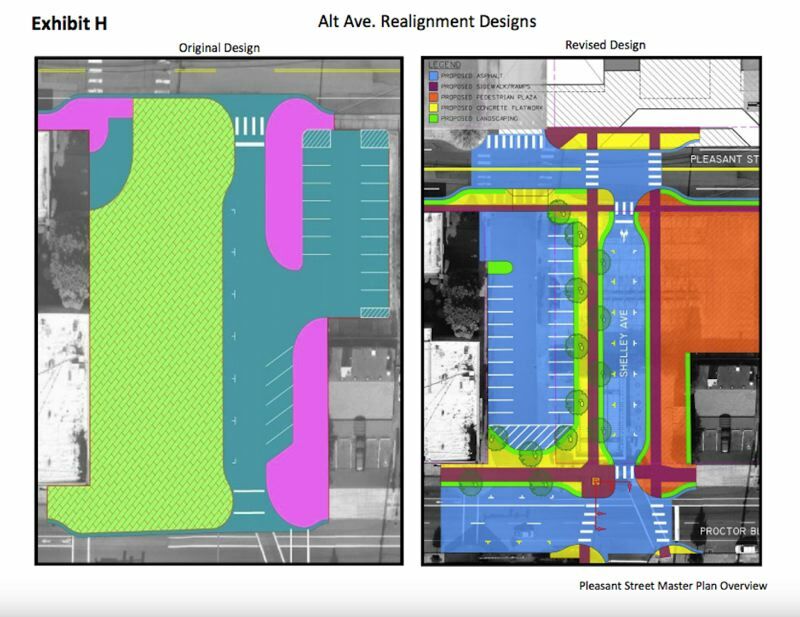 Downtown Planner Emma Porricolo presented a revised conceptual plan that considers the need for sidewalks and pedestrian spaces along Pleasant Street, improving the streetscape and making it more attractive to pedestrians and future businesses. It also includes the idea of realigning Alt Avenue with the nearby Shelley Avenue to address safety concerns the city and its contractor, AECOM, have found with the intersection in front of the Sandy Public Library on Proctor Boulevard. AECOM is a multinational engineering firm that provides design, consulting, construction and management services. The plan's most controversial component, the realignment of Alt Avenue with Shelley Avenue, was the talk of many Sandy residents who attended the council meeting. Several people attended the council meeting in solidarity with Clackamas County Bank President Cathy Stuchlik. 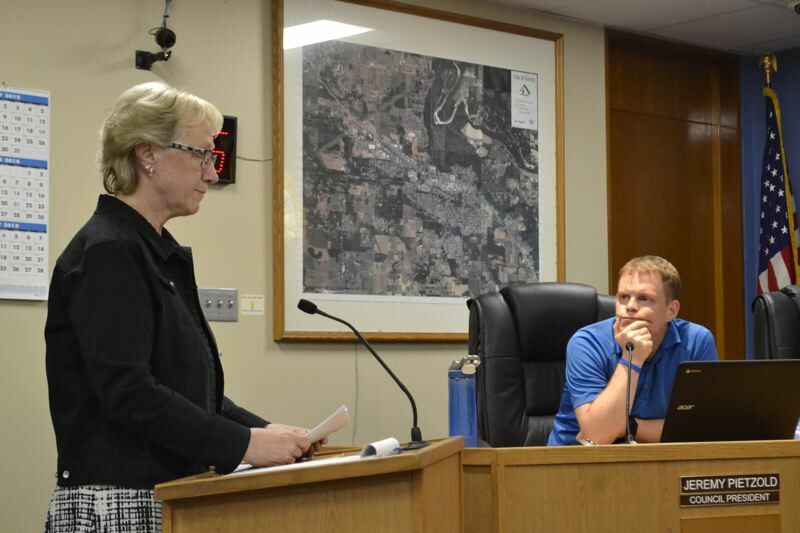 Stuchlik voiced her concerns about losing parking spaces if the proposed plan proceeds to eliminate the Leathers Fuels building and move and create a new, smaller parking lot where Alt currently exists. The conceptual plan would create a pedestrian plaza where the current bank parking sits and make a new parking lot running along the east side the bank. The original lot held 44 spots, the new one would allow 26 visitors. "We're not against a Pleasant Street Master Plan if they want to develop back there," Stuchlik told The Post before the June 12 meeting. "(But the parking) is just not adequate. We have 41 employees and 44 parking spaces. Bottom line, we don't want to be adversarial. The lack of communication (in the beginning) — we were taken aback with all we do with the community. Going forward we really want to work with the city and get all of this resolved." After seeing Porricolo's presentation and hearing Stuchlik and her supporters' concerns, the council advised city staff to look at the area proposed for realignment again, this time taking the bank's concerns into account. "We should look at getting more parking in there for the bank," Mayor Bill King told city staff. "I'd like to see if there's a way for the bank to be made whole." "I think the council was very appreciative of the bank and what we've been to the community," Stuchlik said. "I think they're very objective. We feel very good about the meeting (on June 12). We really appreciate the fact that people came to the meeting to support the bank." Lila Leathers, owner of Leathers Fuels, is equally concerned with the realignment plan. She attended the meeting to provide testimony about the city's research into her property. The city recently asked AECOM to survey the site of Leathers Fuels, 39021 Proctor Blvd., citing an investigation into a fuel leak that Leathers said occurred nearly 30 years ago. Leathers expressed concern that the city might damage the reputation of her business. "So 30 years ago the leak happened and we've been cleaning it up," Leathers told The Post. "We could have it closed up in a few months. There is no leak there and has been no active leak for many years. We've been on top of it. We've done everything according to (Department of Environmental Quality) standards. I just don't like people thinking we have a leak there. No matter what any environmental consultant company says, the DEQ has the last word." Meanwhile, the city is apprehensive about purchasing the site of Leathers Fuels and the adjoining bank parking lot. "There's an environmental issue with both properties because of an old spill," City Manager Kim Yamashita said. "It's an active report filed with DEQ. (That issue) would certainly have to weigh in on the city's consideration of purchasing that property." Following AECOM's survey of Leathers property, city staff forwarded the information they received to the bank and to Leathers. "We were simply doing our due diligence and provided them with the information we were provided with," Yamashita said. "Given the environmental issue and the bank's response and concerns and trying to be respectful of those concerns, we will definitely be looking at all of our options, including possibly not realigning Alt Avenue."